Two 'profiles' of hills near Golconda and Hyderabad. 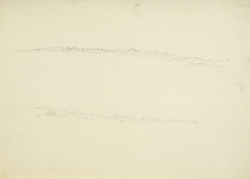 bl.uk > Online Gallery Home	> Online exhibitions	> Asia, Pacific and Africa Collections	> Two 'profiles' of hills near Golconda and Hyderabad. Pencil drawing from the MacKenzie Collection, of two hills in Golconda by an unknown artist, c. 1797. Golconda in Andhra Pradesh was the centre of a rich and powerful state formed on the disintegration of the Bahmani kingdom. There is a fort here situated on an isolated granite hill which was a thriving commercial centre in the 13th and 14th centuries, and later became a flourishing centre under the Qutb Shahi Sultans in the 16th century. The outer curtain wall of the fort is 4.8 kilometres, or 3 miles in circumference and incorporates a total of 87 bastions. Within this wall is a second double wall which circles the town and an inner wall which encloses boulders and other natural landscape features. A number of interesting buildings are situated at the fort including the Diwan's Palace and the Jami Masjid.